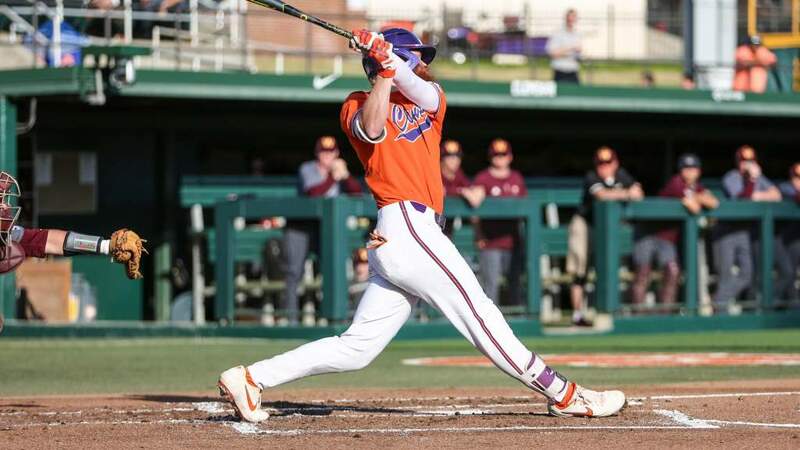 Clemson, SC- Michael Johnson went 5-for-6 with six RBIs to lead #14 Clemson to a decisive 13-2 victory over Duke on Tuesday night at Doug Kingsmore Stadium. Both the hit and RBI total matched career highs for the slugger from Georgetown, SC. The win gave Clemson the series and improved the Tigers to 33-14 on the season (10-8 in the ACC). The Blue Devils fell to 16-30 on the year (2-18 in the ACC). Steven Jackson (7-2) earned his third straight win for Clemson after giving up just four hits in 7.0 shutout innings, which tied a career high for innings pitched. Kevin Thompson (2-9) suffered the loss after giving up six earned runs in 1.2 innings pitched. Clemson struck first, scoring three runs in the bottom of the opening frame. Russell Triplett and David Slevin extended his hitting streak to nine games with an RBI double. The Tigers extended the lead to 6-0 in the second inning after Johnson hit his 10th home run of the year, a three-run shot that hit off the screen of the batting cage in right field. Johnson now has 56 career home runs, three shy of Jeff Baker’s record at Clemson. Clemson put up an additional run in the fourth inning. Johnson doubled down the right field line, advanced to third on a wild pitch, and then scored on an RBI single up the middle by Kyle Frank. The Tigers tacked on another three-run inning in the bottom of the fifth. Zane Green hit his second double of the game to score Ryan Hub. 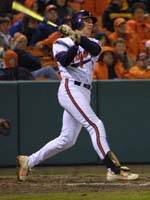 Then, Johnson hit a single to right field that scored Green and Steve Pyzik. Duke got on the board in the top of the eighth inning after Lee Lawrence scored from third on a sacrifice fly by Tim Layden. Duke added a second run when John Berger hit an RBI single. Clemson padded its lead in the eighth when Collin Mahoney hit an RBI double to center to score Garrick Evans from first. Two more runs scored after Herman Demmink hit a single through the right side, bringing the Tiger lead to the final 13-2 mark. Clemson returns to action Wednesday night for a non-conference game against Elon. 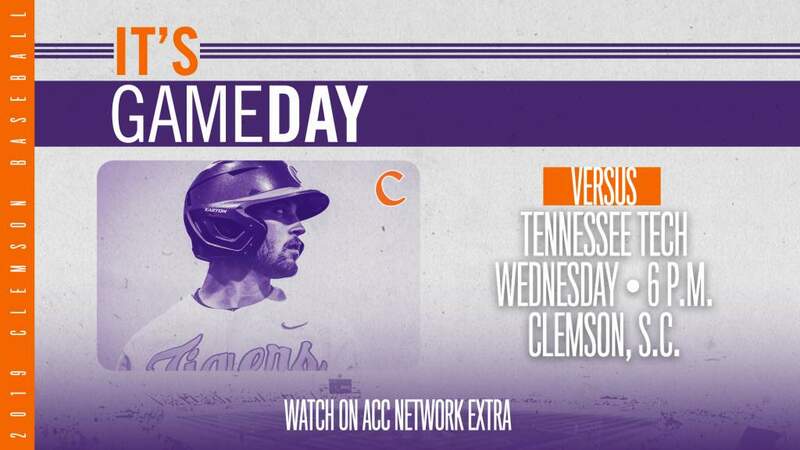 The game can be heard on Clemson Tiger Sports Properties and followed on the Internet via live stats. First pitch is slated for 7:15 PM.